Fully reformed 4/5 bedroom detached country property for sale in the Arboleas area, set in a plot of 687m2, with a workshop and jacuzzi. A tarmac road gives access to the property, where there is a terraced patio garden to the front of the house and a parking area opposite with space for up to 4 cars. The front door opens into a good sized lounge with a gas fire and stairs leading up to the first floor with storage space under. From the lounge a door leads into the dining room with a small room leading off which is currently used as an office. It would be possible to use the dining room as a 5th bedroom as the office has plumbing in place for conversion to an ensuite bathroom. The large fully fitted kitchen includes a built-in oven, gas hob, and fridge. An internal hallway gives access to a bathroom comprising bath with shower over, WC and basin set in a vanity unit. A door leads out to a courtyard area with storage shed off, a retractable awning to provide shade, and steps leading up to a terrace. There is a second part-covered courtyard which houses a jacuzzi. Also on the ground floor is the master bedroom with walk-in wardrobe and en-suite shower room comprising shower cubicle, WC, and a basin set in a vanity unit. The first floor comprises 2 double bedrooms with fitted wardrobes, a shower room with corner glazed shower cubicle, basin and WC, a second lounge / 4th bedroom with gas radiator and doors to a balcony, and one further triple aspect room currently being used as a sewing room. In addition, the property benefits from a 4x2m workshop with electricity connected, a 4m2 shed, and a utility area with WC. There is also a large walled terrace and a separate vegetable garden area. 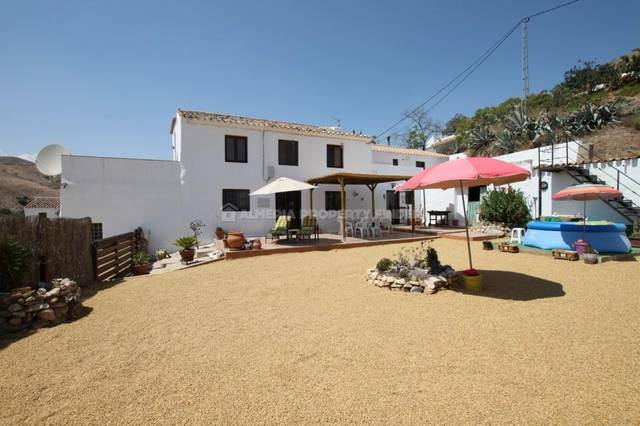 Situated in a tranquil area only 15 minutes walk from the town of Arboleas where all amenities can be found.